That’s a high bar so the term shouldn’t be bandied around willy nilly. 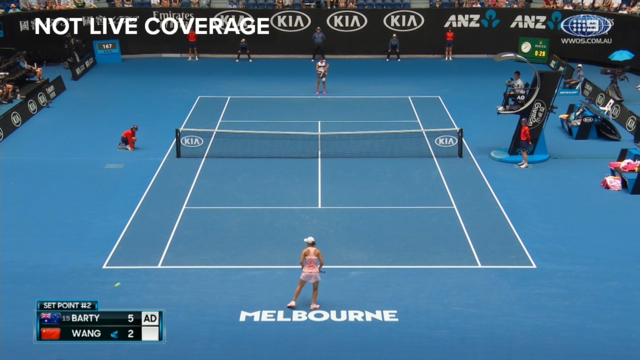 But when Nine commentator Todd Woodbridge described an Ash Barty point as ‘Federesque’ midway through the first set of her comfortable 6-2 6-3 second round victory over Qiang Wang, the description sat comfortably. According to Woodbridge, Barty has the best slice backhand in the women’s game and when she’s using it well she pins her opponent in the corner waiting for a short reply to thump into the open court with her whippy topspin forehand. As she hits it she moves forward to the net and uses her world class net game to finish the point. The young Aussie may not have the charisma or even a tenth of the resume of the men’s tennis GOAT but in the way she constructs her points there are plenty of similarities. Federer doesn’t like to waste energy in the early rounds and in Barty’s clinical first two matches this tournament she’s been about as economical with her energy as anyone. In total she has lost just nine games and hasn’t really looked like losing a set. Of course that’s where the comparisons for Barty end with the Swiss maestro and any other top player in the men’s or women’s draw. Over the last 12 months she’s proven that she can handle her business in the early rounds of a grand slam. What she is still yet to do is impose herself on the second week. That point was touched on at one stage by Woodbridge as Barty took her foot off the gas after getting to a dominant position against Wang. “There’s a difference between outplaying your opponent and intimidating them,” Woodbridge said. While Barty pushed Wang in the following game, getting out to a 0-30 lead, unforced errors brought her bid to break back undone. Those are the kind of little things the 22-year-old still needs to get better at to become a genuine grand slam contender. Chances to get momentum back on your side are far rarer against the best, as Barty found out once Petra Kvitova found her groove in the Sydney International final last week. Wang’s a top 30 player but she doesn’t have the pedigree of the stars the Aussie will have to beat if she’s to make history as the first local women’s player to lift the Daphne Akhurst Memorial Cup since Chris O’Neill way back in 1978. So it was that in her next service game the Chinese player gave more break point chances and this time Barty was good enough to take them. With the impetus back with her, Barty finally put her foot on the throat and sprinted to the finish line. Onto the third round, where Australia’s big hope will have a huge chance to set a new mark for her best result in her home grand slam. After that, who knows what’s possible. Let’s just hope it’s Federesque.